The Painted Desert is one of the most important records for me of this decade, as it opened my ears to sounds and textures in music that had previously eluded me. The Painted Desert made the impenetrable world of jazz seem like something I could reach and experience for myself. Desert was followed by the equally wonderful Earthspeaker. As with all the great artists whose music inspires and entertains me, I found myself growing more and more impatient to hear more. I hope my neighbors weren't watching as I ran/speedwalked/skipped from the mailbox to my apartment the day Zenga arrived. I disgraced myself with the zeal with which I tore open the envelope. I'm surprised I didn't break something putting that CD in my computer to put it on my iPod and then in my stereo to listen to it. Sticking with the theme of a journey, that's how I like to think of Zenga. I remember listening to it as I drove through the Smokey Mountains on my way to see Springsteen in Greensboro, melding the sounds and rhythms of the record with the scenery around me. Without a single spoken word, Zenga takes listeners to the corners of the universe, traveling to places real and imagined. "Father of Skies" takes me to a place of mystery, with a long shadow that is at times foreboding. "Firefly" is a place of tranquility with some delicate but assured piano work from John Rangel. "Roll The Bones" is powered by Martin's exotic rhythms and vibraphone work, wonderfully accompanied by Joe Doria's piano and Kanoa Kaluwiha's saxophone. "Alhambra" is a call-repeat with the players taking turns offering the the melodic theme of the piece and responding and repeating it. Beyond the technical this is a sound of warmth and friendship, the sound of a smile. "Shapeshifter" is a journey in itself, doing exactly what the title suggests. Rangel's piano and Martin's vibes combine to introduce a spare, moody theme before being joined by Dave Carter's great trumpet work and then it turns on a dime to a Latin jazz motif. The quick turnaround is well executed, but it's hard to say farewell to the first theme when the second is introduced. Again, Carter's trumpet shines as does Martin's quick, slick drumming. Rangel reintroduces echoes of the initial movement to the rhythm of the second, bringing the journey full circle before galloping off in yet another thrilling direction. "Dragon Skin" is a journey into the nocturnal world, colored by Martin's vibes skills. Full circle is an important element of Zenga as the circle, or Enso, is an important component in the art of Zen painting. 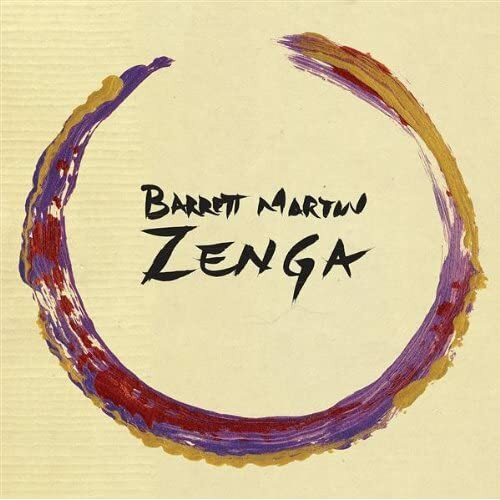 "Zenga" is the Japanese word for the art of spontaneous Zen painting, and the cover art of Zenga is an example of that type of art painted by Martin. Martin is ordained in the Zen practice. As it turns out, this really isn't the final step in the Zenga journey because this is a journey with no end.